Should you find yourself shopping for bacon at the Piggly Wiggly on Hilton Head Island (South Carolina) and to your dismay, you should also find yourself sans wallet (but slathered in sunscreen), do not, Gentle Reader, be afraid. Many things have evolved at this grocery chain which stands tall as the quintessential store synonymous for both its cheerful porcine mascot (Mr. Pig loves kids!) 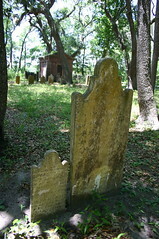 and democratic selection of Southern food (ribs, anyone?). Namely, the chain now offers the option to purchase your pork rinds using only your index finger and a smile. Biometrics have broken the bargain shopper barrier. Since June 2005, Piggly Wiggly shoppers across Georgia and South Carolina have been able to pay for groceries with the touch of a finger. When I ran across the contraption whilst vacationing, I conducted an impromptu interview with the store owner and his longest-employed cashier. Neither one could quite remember when they started using the technology. However, the cashier summed up the ROI for the IT biometric device: "The old people really seem to like it. And there are a lot of them down here. You know, retired people and stuff." According to Biometrics.com, the Piggly Wiggly chain has been using the Pay By Touch system in Georgia and South Carolina since June of 2005. "We tested Pay By Touch at four stores in South Carolina and found that our guests loved paying for their groceries with a quick finger-scan because of the convenience of not having to fumble with wallets at check-out," said Rich Farrell, vice president of information services at Piggly Wiggly Carolina Co. "We also found that frequent Pay By Touch users saw Piggly Wiggly as more dedicated to providing better customer service -- and that is very important to us." "Pay By Touch is making great strides in changing the way we pay for things today and in the future," said John Rogers, founder, chairman, and CEO of Pay By Touch. "This is an exciting time for stores like Piggly Wiggly, whose customers have already seen the value in using Pay By Touch. We're helping to provide customers with a highly secure way to pay while also making shopping easier and faster." The one-time Pay By Touch enrollment is simple and takes just a couple of minutes. 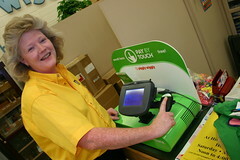 Shoppers can enroll at Piggly Wiggly stores at the guest services counter, or by visiting http://www.paybytouch.com/. Shoppers select the accounts they want to enroll in a finger-accessed electronic Pay By Touch wallet. These accounts include Express Checking, which is a direct electronic withdrawal from an existing checking account, and/or any existing major credit cards, plus their PFC PFC/GREENBAX rewards card.